The FX spread betting markets are finally getting twitchy, with Sterling overcoming yesterday's poor economic data and now rallying through the heavy $1.6460/80 resistance to trade at $1.6540. Resistance now turns to support. So traders will be watching for any move back down here. There is more strong resistance to a close above $1.6550 and if we manage this then dealers may target the highs of the year at $1.6745. The last few years have shown how difficult it is for Sterling to hold above the $1.64/65 level, with particular pressure building from $1.6740 and higher. If this is challenged then the pound could be on a rocket but of course we have been here before. Earlier I was listening to a couple of forex dealers actually talking about the possibility of the Sterling becoming a safe haven currency. 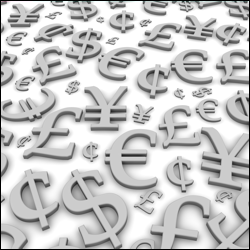 With the issues the euro is experiencing, the Swiss Franc and yen being so overvalued and with investors trying to divest out of the dollar, the pound might benefit as a venue of last resort. The FX spread betting markets are fairly peaceful at the moment, watching everything else rush about, with the pound regaining some of its ground lost and trading back at $1.6430. The Sterling/dollar spread trading pair has fallen on the poor German GDP data and has now given up much of yesterday's rally at $1.6330. The support at $1.6300/10 is actually quite strong but below here we are looking at $1.6235/45 and $1.6085/95. On the up side, the big level is $1.6480/90 where we have run into a brick wall a number of times over the last few weeks. Virtually anything over $1.64 is a struggle to hold onto. However, if we do, then sentiment may well turn heavily in Sterling's favour. In the FX spread betting markets we are running into the battle to see who can have the weakest currency. Everyone wants currency weakness to bolster hopes for export growth and, existing, debt devaluation through containable inflation, although I personally believe it to be a false crutch. In this scenario fundamentals get washed out into the gutter as we can see from the massive over valuations of the Japanese yen and Swiss franc which are believed to be the safe haven deposits. Rather like the 'yen carry trade' of the early '90s this appears to be the safe trade to go for but when it goes wrong it will really go wrong. Oddly enough while all the chaos of the last week was going on the FX markets were actually quite quiet. For the pound the prospects are very difficult to see. Debt has performed well as everyone focuses on the woes of Europe but we must fear that when this has been played out the markets may then turn their fire power onto the UK. Fortunately, like the US, the UK can make fiscal decisions based solely on their own requirements and this may dissuade the naysayers in the medium term. Looking at the FX charts we can see that the currency has basically been stuck between $1.59 and $1.66 since the end of January which is creating buying and selling opportunities for those who have traded the ranges longer term. Price resistance is at $1.6300/10, $1.6330/40, and $1.6460/80 support at $1.6230/40, $1.6160/80 and $1.6100/15. The rumours that swirled about the trouble engulfing the French banks were strongly denied yesterday and jobless claims from across the pond came in better than expected. This led to financial spread betting investors seeing a recovery in the single currency against the US dollar, gaining 78 points to close at $1.4215. At the time of writing, pressure has been reinstated though, with the pair trading at $1.4177. The Swiss franc tumbled from its recent lofty highs yesterday, as comments from Swiss National Bank VP Thomas Jordan ignited concern. He said that a temporary peg to the euro would be legal and part of the central banks tools which could be used to stop the appreciation in its currency. The spotlight shone on the pressure on the Swiss economy by a strong Franc and the fact that the intervention earlier in the month was not enough to boost exports and help growth. Overall, the euro/Swiss franc rate fell to SFr 1.0800 whilst the US dollar/Swiss Franc market lost 363 points to SFr 0.7623. The strength in shares is equating to US dollar weakness across the board with euro/dollar and sterling/dollar being bid higher. The Australian dollar is also seeing a nice bounce, having been under pressure of late. Australian dollar/US dollar is at $1.0285 having recovered from parity on Tuesday. The US dollar remains the whipping boy and dollar/yen is only a few ticks above is fifteen year low at ¥76.50. Interestingly it is just about holding its own against the Swiss Franc, just above the recent lows at SFr 0.7290. On the economic data front, the highlight of the day is the Bank of England's quarterly inflation report. We all know that downgrades to the GDP forecasts are expected and so confirmation that interest rate hikes will be left as is can be expected. With all that has gone on in the past couple of weeks, and oil prices plunging from their highs, the inflation doves will see the weight of the argument behind them for now. As a result, inflation forecasts could well be kept in check when expectations had been for them to be revised upwards. The dollar was the dog of yesterday's session on the FX spread betting markets. This came following the FOMC meeting, which caused the euro to gain ground back to above $1.4300 and the pound/dollar to try and get back above $1.6300, but this didn't last long. This morning both rates are at $1.4320 and $1.6255 respectively, so the euro has just had the edge on Sterling in the past couple of days. This was partly following the worse than expected manufacturing and industrial figures from the UK yesterday and has brought the pound/euro rate back from €1.1500 to €1.1350 this morning. The euro/dollar market had a disastrous day yesterday and at one point had fallen nearly 300 points. Sovereign debt is back on the table and is a big worry, with France apparently being the next in line to be downgraded. The pair bounced overnight, but is trading lower since the market opened this morning to $1.4242. There is support at $1.4150 and resistance at $1.4236. However the pair has struck against its resistance and could signal further downside here. For the first time in five months the Australian dollar dropped below parity with the US dollar on the back of sovereign debt and US slowdown concerns. It then bounced back to recover from the 2.5% intraday loss, showing there was a bit more of a demand for riskier currencies as equity markets rebounded. This morning the pair is trading lower at $1.0149, but its rebound has been capped by a declining trend line, which can be seen viewing the pair on a ten minute spread betting chart. This could signal downside, so traders should be cautious here. The US's rating downgrade at the end of last week was not a huge surprise as the financial markets had been warned consistently that there was a chance it could happen. Now it's only a matter of time before the likes of Fitch and Moody's will follow suit. The dollar has been beaten around the head again after the downgrade with USD/JPY reversing all its gains from Thursday and Friday after the Bank of Japan's intervention. It briefly reached back above the ¥80.00 level before swiftly reversing its gains and then slowly but surely has given back half, taking us back below ¥78.00. At the time of writing dollar/yen is at ¥77.85. Even last week's better than expected Non Farm data wasn't enough to boost the US currency. We've now seen it slip to a record low against the Swiss franc. Naturally this is seen as a real safe haven currency and nervous traders were piling their cash into the franc.